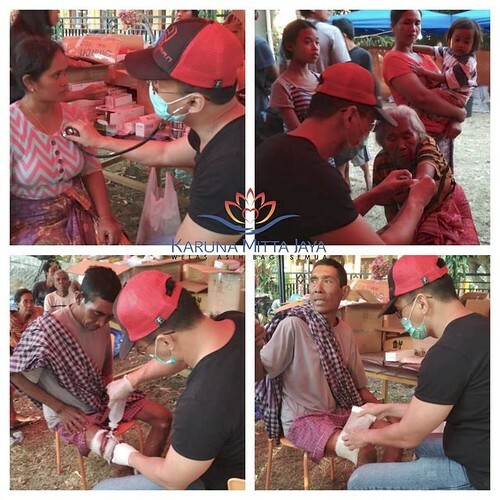 In the wake of the series of devastating earthquakes and aftershocks that shook Lombok, Indonesia, earlier this year, the Buddhist non-profit organization Karuna Mitta Jaya (KMJ) has been working tirelessly in the weeks since to provide some measure of comfort and relief to thousands of survivors living with the aftermath of the disaster. Lombok, an island in Indonesia’s West Nusa Tenggara Province, suffered a series of violent temblors in 2018, staring with a 6.4 magnitude quake on 28 July that killed 20 people, injured hundreds, and cause widespread damage. Just a week later, on 5 August, a 6.9 magnitude earthquake struck—the most powerful to hit the region in recorded history—shaking the entire island and creating tsunamis. Official reports indicated that at least 80 per cent of the structures in North Lombok were damaged or destroyed. The quake and two major aftershocks on 9 and 18 August resulted in a total of 563 people confirmed dead, more than 1,000 confirmed injured, an in excess of 417,000 people displaced. The island was hit by a third major tremor on 19 August, which was also measured with magnitude of 6.9, leading to 14 deaths and damage to some 1,800 homes. Working in cooperation with the South Korea-based Join Together Society (JTS) founded by Buddhist monk Venerable Pomnyun Sunim, and the Thailand-based International Network of Engaged Buddhists (INEB) founded by Buddhist activist Sulak Sivaraksa, KMJ has been offering relief supplies and counseling, and helping to set up temporary housing for the thousands of displaced and homeless survivors struggling to recover from the devastation wrought on their community. “Our programs in Lombok include providing aid to the victims, building temporary shelters, sending volunteers to teach and counsel the children, and helping them to set up small scale businesses such as shops to rebuild the local economy,” Yogiawati said. Founded in December 2012, Karuna Mitta Jaya is the social organization wing of the Indonesian Theravada Buddhist Family (KBTI), itself comprising the Indonesian Theravada Sangha, the Indonesian Theravada Priests Council, the Indonesian Theravada Women’s Association, the Indonesian Theravada Youth Organization, and the Indonesian Atthasilani Organization. “As KMJ representatives, Wenny Lo and I are on good terms with long-time INEB supporters from Indonesia, Agus and Winto. They recently established an INEB-inspired network called the Indonesian Network of Engaged Buddhists (INA-NEB), with the goal of bringing together like-minded Indonesian Buddhist activists who want to apply the teachings of the Buddha into real action to overcome suffering,” Yogiawati explained. 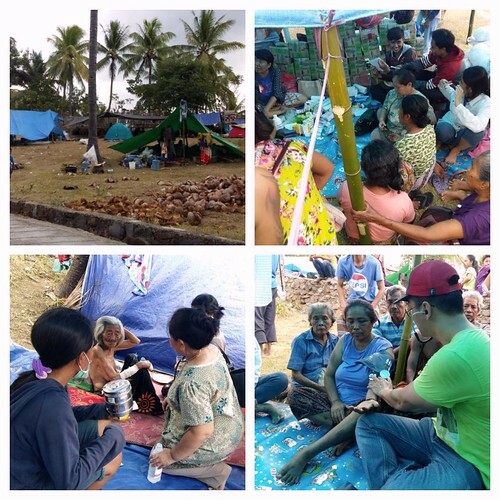 “When the earthquake struck Lombok, we learned that the victims were in dire need of temporary shelter as the rainy season is approaching and most of their houses were destroyed. We need 3,000 temporary shelters and each costs around US$250. We did our best to solicit funds from a number of generous donors and organizations. We needed all hands on deck; the INA-NEB team then asked INEB Executive Secretary Somboon Chungprampree for support. Somboon then contacted JTS and the next step was coordinating between INA-NEB and JTS." “INA-NEB successfully convinced JTS about the need to visit the area and witness the devastation and the urgent need for help. 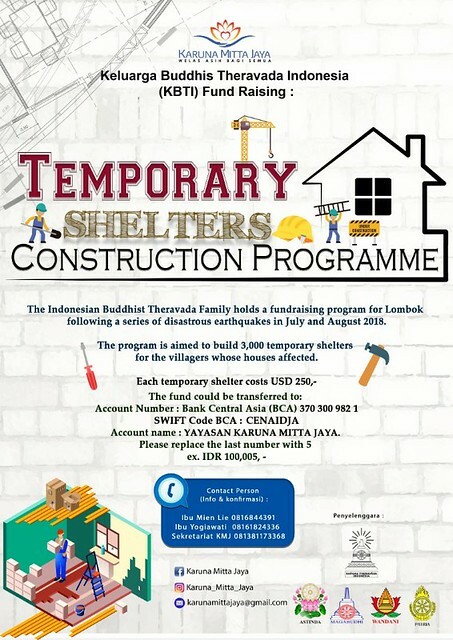 There is a unique Buddhist community in Lombok that the world might never hear about, and most of their houses and temples were destroyed. They also need help preserving their cultural heritage by reconstructing the temples. JTS has donated funds for the construction of 40 temporary homes and also plans to help construct school buildings. We couldn’t be happier or more grateful for their generous support.